You will need a map for this. Try this one! v.63 Isn’t it ironic. The children of Judah were not able to take the city which was later to become the place where the Lord would cause His name to dwell. Surely this is a further demonstration that Yahweh was in control of the conquest. v.2 - the word bay (03946) is normally translated tongue or language. This presumably meant that it referred to the tongue shaped bay at the south of the dead sea. Without the aid of a map, the only way they would see this is by looking down on the shape of the dead sea from the top of the mountains by way of the massive drop that there is to it shores. There is a substantial overlap between the period of Joshua and the time of the Judges. Whilst Judges follows on from Joshua some of the events recorded there took place under the leadership of Joshua. 15:16-19 is found recorded in Judges 1:12-15. 15:29 Baalah is actually Kirjath Jearim (Josh 15:9) Important to be remembered because of the way in which we are introduced to Baal of Judah (2 Samuel 6:2). 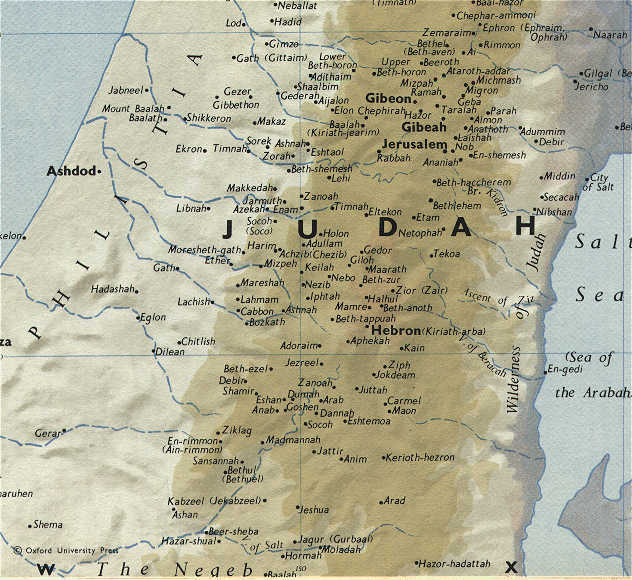 Whilst it is difficult, if not impossible, to locate all the places named in this chapter simply getting out a Bible map and looking at the place names mention in the marking of the border (:1-12) will help to clarify, if needed, the actual border of the inheritance of Judah. This can then, of course, be done for all of the tribes mentioned in subsequent chapters. 15:63 Contrast Judah's inability to drive out the inhabitants of Jerusalem here with their success Judg 1:8,9. But we have noticed - see comment for 2002 - that part of Joshua 15 is found in Judges 1. The book of Joshua has a different purpose from the book of Judges. Joshua gives the historical data at one point in time whilst Judges 1 gives an accurate description at a slightly later time as it is setting the scene for the time of Judah's kingship. Gen 50:13; Kirjath-Arba given to Caleb Josh 14:15, being the previous home of the giants, as in today's chapter. Can I suggest that it was also the birthplace of John the Baptist? Hebron became a Levitical city Josh 21:11 "in the hill country of Judah". That is just the description used in Luke 1:39, where Mary went to visit Elizabeth. Her cousin was of the daughters of Aaron, and her husband Zacharias was a Levite. It's therefore highly probable that the city in which John was born was Hebron. V.17 Othniel was the son of Caleb's younger brother Kenaz (Judg 1:13). One wonders if, forty-five years earlier whether Kenaz would have been older or younger than twenty. If he were older, of course, he would have died in the wilderness; if younger, he would have entered the Promised Land. There is no other mention of Kenaz, or when his son Othniel was conceived. Interestingly, Caleb's grandson was named Kenaz (1Chron 4:15). Othniel, the first judge in Israel (Judg 3:9), was married to his cousin, which, it seems, was still an acceptable practice. When considering Judah, it should be remembered that the tribal allotment of Simeon lay within its (Judah's) boundaries (Josh 19:1). 15:60 The way in which Kirjath-Baal is given the modern name Kirjath-jearim is important as it provides for later readers – for example in the days of David – a link between the modern town and it’s ancient name elsewhere in Scripture. 15:63 The way in which the Jebusites dwelt with the children of Judah becomes a description of the way that the whole nation was in the days of the Judges. Judg 1:28-33. A parable of our lives. If we do not deal with those things which drawing us down they will remain with us interfering with our commitment to our father. V.4 Some believe that the river of Egypt is not the Nile. River here is translated from the Hebrew nachal which is a dry river bed that swells to a torrent during the winter rains. In Arabic, this geographical feature is called a wadi. The river of Egypt is referring to the Wadi el-Arish. A continually flowing river is described in Hebrew by nachar. This word defines such rivers as the Nile, the Tigris, and the Euphrates. However, others such as Rashi, Rabbi Yehuda Halevi, and various Targums (Aramaic translations of the Tanak - Hebrew Bible) believe that the river of Egypt refers to an arm of the Nile, but not the main body of the Nile. They contend that the word nachal can be used for any flowing stream and does not fit the description of a wadi. It is interesting, though, that no map of the tribal allotments of Israel shows Judah (the southernmost tribe) extending into the Sinai. Judah's southern border cuts off at the Wadi el-Arish. During the 1967 war, Israel conquered the Sinai and occupied it. Israelis built settlements there. But, in the subsequent peace agreement between Egypt and Israel the Sinai was handed back. Of course, the settlers were upset, but it was pointed out by the rabbis that the Sinai was not part of the Promised land. 15:2 The ‘Dead Sea’ as we call it is always referred to as the ‘Salt Sea’ in Scripture. Once upon a time there were three giants.. The three giant grandsons of Arba; Sheshai, Ahiman and Talmai, were the specific reason Israel failed to enter the promised land. This can be seen by these verses (Num 13:22, 28-33, Deut 1:28, Josh 14:12). Caleb had been one of the twelve spies who personally saw these three giants in Hebron (Kirjath Arba, "the city of Arba") in Num 13:21-22. His faith allowed him to personally stand up against them when he finally entered the land 40 years later, and posses their city (v13-14). This area is Hebron (Josh 21:11) which is now in the West Bank administered by the Palestinian Authority. Looking on a map we can see that rather than the city name being changed to Hebron, Kirjath Arba now exists alongside Hebron. It is amazing that this is the case, and that people still exist today who wish to bring back the name of this father of the giants who resisted Israel's invasion. More amazingly still, it appears to be the Jews themselves who established the town and brought back the name. This is possibly because way back in history Abraham, Isaac and Jacob all lived peacefully in Kirjath Arba (Gen 23:2, 35:27). Josh 15:16-19 - Othniel (name means "lion of God") and his wife Achsah (name means "anklet" i.e. an ornament) obtained fertile fields fertilised by living water to refresh their inheritance, which would otherwise have been in a dry place, They sought and asked for that refreshment. They were as a bride of the Lord in the wilderness of life seeking and praying for spiritual refreshment. This demonstrated to Israel (and us) that while the Lot determined the inheritance of a particular tribe of which he was a member, each must "work out his salvation" through faith and by personally working for it. Some of the above was gleaned from The Book of Joshua: Verse by Verse Exposition by H.P. Mansfield, pps.157-158. 15:3 repeatedly, in describing the borders of territory Scripture uses the phrase ‘fetched a compass’ – what it means is that at the location mentioned the border turned. 15:14 There were giants in the land when Caleb first spied the land – Num 13:28 - but here we see that the confidence he displayed at the beginning of the wilderness journey is still there. The ‘sons of Anak’ were giants. 15:2,5,12 The way in which the border is marked out follows a logical route. Whilst the list of place names might seem haphazard to us I suggest that this is because we are not familiar with the geography of the land of Canaan. If we have a map of the land before us we can trace easily the borders. If we get to know the lay of the land well we will be able to follow the borders in our mind as we read. This is true here and in every place where places are named. 15:8 In explaining that “Jebusite” is Jerusalem we see an indication that the book was written, under inspiration, for a people who, later, might not remember the historical origins of the city of Jerusalem. Othniel is a type of Christ. His conquest of the city of Kirith-sepher in v17 is an allusion to the saving work of the Lord Jesus Christ, as described in Rev 5:5 Kirith-sepher means “city of the book”. Debir means “place of the word”, or “living word”, or “oracle”. In Josh 15:15-17 the “city of the book” is conquered, and becomes the “place of the living word”. In Rev 5:5, the conquest of the Lion of the Tribe of Judah opens the scroll d its seven seals. These seven seals represent God’s plan for this earth. It was only through Christ’s victory that these plans could continue as God intended. Remember, prior to his crucifixion, not even Christ himself knew the day or the hour that he would return as King of this earth. This knowledge was known only to God, not even the angels knew. Christ’s victory turned the Bible into God’s living word. God’s word fulfilled is the proof of God’s existence. Likewise Othniel’s victory, his conquest of the City also fulfilled God’s Word. Kiriath-sepher becomes a symbol, an oracle, of God’s living word. ‘The place of the Word’ foreshadowed the future Christ who would be the ‘Word made flesh’ (John 1:14). The Jews had their Book, but it was written to point forward to Christ, the livingWord (Heb 1:12). Moreover, note that it only describes Othniel capturing the city in v12 - no mention of anyone else. Does that sound impossible? Well, it sounds impossible for one man to live a sinless life But Jesus did that, for as he said in Matt 19:26, “With men, these things are impossible, but with God all things are possible”. 15:15 In mentioning both the current and old name of the city those who later would read the record are given enough information to be able to link the city with previous events. 15:1 Judah was to lead in battle, Judah led the camp in the wilderness and now it is the first tribe to be told its inheritance in the land of Canaan. 15:4 the mention of Azmon and the border shows that very precisely the instructions in Num 34:4-5 were followed. 20 v.3 - Naked is the state in which we all are before God at all times. We can hide things that we are ashamed of from our fellow man, but not from God. God, however, offers to clothe us if we will accept this, with righteousness. Gen.3:7-8, Exo.32:25,26, 2Cor.5:1-5, Rev.3:18, 16:15. 21:9 Babylon is fallen, is fallen; - before Babylon has even risen to power. Such is the wonder of the way in which our father works. This prophecy is echoed [Jeremiah 51:8 Revelation 14:8 18:2]. That Isaiah’s words were fulfilled in the coming of the Medo Persian kings gives us confidence that the words of Revelation will also be fulfilled in due course. 21:6 - The concept of the watchman in the watchtower is quite a feature of Isaiah - 21:6,8,11,12, 52:8, 56:10, 62:6. Enacted parables (20:2) are a feature of some of the prophets. The prophet will do something to demonstrate, over a period of time, what God intends to do. Ezekiel is a classic example of such enacted parables. Consider how you would react if you saw a man behaving as Isaiah was doing at this time. Surely his actions must have had some impact on those who saw him. ch 21 - Remember that this vision of Judah being freed from captivity in Babylon was written before Israel were taken captive by the Assyrian. ch.20 - WHAT DO YOU RELY ON? Sometimes the things we think are the most stable things in our lives are suddenly taken away from us and we find our lives falling to pieces around us. We can often find that we place too much emphasis on possessions, money, jobs, family, relationships or enjoying life that we end up making one or more of them the foundation of our life. If those sort of things become our foundation our whole world can fall down when they fail. There were people in Isaiah 20 who trusted in Cush and Egypt and in their military strength to deliver them from the might of Assyria. But the strength of Egypt and Cush were to fail and those who boasted in their strength were to be afraid and put to shame. There is only one thing that is really strong enough and secure enough for us to place our faith and strength in. That strength is in the LORD our God. He will never change. He will always be strong. He will always be there for us and he will never let us down. So even if the world moves and shifts around us as shifting sands, we can rely on the rock that we have built on - God our stronghold. ch 20 - One presumes that Isaiah actually performed this enacted parable in Egypt? Or was it for the benefit of Israel who were to invaded by the Assyrians. If Israel saw it Hezekiah may well have taken the fulfilment of these things as the assurance that God would deliver him. 20:1 Ashdod was called Azotus by the Greeks Acts 8:40 Being located on the Mediterranean, the taking of it was a necessity in preparation for the invasion of Egypt. 21:12 In saying "the morning cometh, and also the night" Isaiah is saying relief is on the way, but it would not be permanent. History has validated the prophesy. Man destitute of faith and interested only in carnal pleasure (Gen 25:27-34;, Heb 12:16-17) has no place in the "morning" that symbolizes the coming Kingdom of Israel. 21:6 The feature of the watchman figures throughout the Scripture. A notable example is the watchmen whom Yahweh has placed around Jerusalem (Isa 62:6,7). Ezekiel sets out the function and responsibility for the watchmen of Israel (Eze 33:1-9). Likewise, we are all watchmen for the spiritual House of Israel, a duty which we should take seriously. 21:11 The burden of ‘Dumah’ is against Edom – and is seen again in Jer 49:7-8 . 21:1 The whirlwinds in the south are spoken of by Zechariah (Zech 9:14). The south wind comes upon Babylon from the deserts of Arabia, and can become violent, as its course is unbroken along the plain. 20:2-4 Ezekiel was the foremost demonstrative prophet. But here we see Isaiah acting out his prophecy against Egypt and Cush (Ethiopia = present-day Sudan). The warning was also for Israel not to put its trust in anyone other than Yahweh (20:5,6 see also Psa 146:3). The term anoint (oil) the shield seems odd (21:5). Shields were made of leather at that time. A well-maintained shield was oiled to prevent its leather from cracking. When oiled, it was ready for battle. 20:1 Ashdod is on the coastal plain of Israel in the area which is now known as the Gaza Strip. Given that the Assyrian army came from the north we get some idea of the extent of their invasion of the land from this comment. They must have taken control of the whole of the coastal plain of the land of Israel from Mount Carmel in the north. 20:1 Tartan is the Assyrian title for commander-in chief. Under Sargon's orders the Assyrian commander laid siege to Ashdod in 716 BC. The fall of Babylon could have been described in many different ways. We could have read lamentations about how its strength had become weak, how its riches had been taken, how its splendour had been destroyed, or its pride made low. All of these would have been true, but there was a more important aspect to the fall of Babylon. "Babylon has fallen, has fallen! All the images of its gods lie shattered on the ground." (Isa 21:9) More than its strength, its riches, its glory, or its pride, particular note was taken of its smashed up idols lying on the ground. To totally destroy a person, city or nations, take away what is closest to their heart. With the gods they worshipped shattered, the people would have no more strength to fight. When the things we worship are taken away, everything in our world collapses and falls apart. Imagine if the most important thing to you was suddenly taken away. This has become reality for many people over the last few months as the current financial crisis has taken its toll. As people have lost the money they put their trust in, there has been a wave of suicides and murder-suicides among those who believed that life was no longer worth living. The cry will go out again. "Babylon has fallen!" (Revelation 18) Will we be among those who lose everything when all the idols are smashed? Or have we put our trust in the everlasting God who will never be destroyed? 21:1-9 These verses predict the conquering of Babylon by Medo-Persia. 21:9 There is a similarity between this verse and Rev 14:8; 18:2. Note the double emphasis: Babylon is fallen, is fallen. This expression in Isaiah refers not only to the city Babylon but also to the Babylonian Empire which existed in approximately 612-539 BC. In the same expression in Revelation, Babylon refers to the ecclesiastical city of Rome and its religious empire. The complete destruction of the Babylonian Empire was sure (Jer 51:37). The same will happen to the ecclesiastical empire of Rome when Jesus returns to earth. 21:2 The treacherous dealer dealing treacherously is seen again (Isa 24:16) in the prophet. 20:6 In telling us how those who tried to flee from the Assyrians felt we get an insight into the horror of the Assyrian invasions – renown for their brutality. It's interesting that the prophecy against Babylon, from Isa 21:1-10, begins by calling Babylon "the desert by the sea". If we look on a Bible map we find that Babylon is about 300 miles from the nearest sea. That would be like calling Birmingham, UK, a seaside city! This suggests to me that there is a possibility that Babylon has been misplaced in modern Bible maps, or that the name is being used for something other than the city of Babylon. Another thing we find out about Babylon in this chapter, is the saying "Babylon is fallen, is fallen", which links this Babylon with the Babylon of Rev 18:2. Here in v17-19 we see that Babylon is a sea trading nation with many ships. If Babylon is confined to the place where the Bible maps have it, that would be extremely difficult! So where or what is Babylon, if not simply the city in Iraq where it is traditionally placed? What, if any, is the significance to the 3 years time period Isaiah walked around stripped and barefoot? The following ideas are mostly from bro. Harry Whittaker's book Isaiah. On the face of it, this is a prophecy with a specific short-term fulfillment, sandwiched between 2 blocks of 7 "burdens" (Isa. ch. 15-23), all of which refer to nations surrounding Judah. It would appear then that this short-term prophecy, readily put to the test within 3 years, served to guarantee the accuracy of the other burdens, both in their primary and later fulfillments. Ashdod, formerly a Philistine city, had likely become a Jewish fortress. And at this time there was a lean-on-Egypt policy (Isaiah would later denounce this!) to the point where Egyptian help took the form of a garrison which essentially made Ashdod an Egyptian outpost. But now, through what Isaiah was commanded by God to do, those Egyptians would see the shame of captivity that would soon happen to them. At this time Egypt was dominated by an Ethiopian dynasty. So if in this soon coming encounter, mighty Egypt and Ethiopia are to be proved so futile and worthless a pair of allies, due to Assyrian's invasion and conquest of them, what hope is there for Judah when Assyrian expansion comes to full blood? "How shall we escape?" That is, if pagan nations with so little light suffer such retributions from God, what can His faithless chosen people expect form Assyria, the rod of God's anger (Isa 10:5)? Is it possible then that in days soon to come, modern Israel, trying to be friends with Egypt, will similarly pay for its faithless misguided statesmanship and be brought to a humiliation (but also deliverance!) comparable to that which came about in Isaiah's day? 21:7 This is the only mention in the Bible of chariots being pulled by camels. 20:3 Isaiah had been a walking sign to the nation even though the prophet’s account does not indicate when he had been told to so walk. 1. Isa 20:1 - the existence of Sargon II was proven (including his expedition against Ashod) in 1842-44,1847, and 1963 in the record chamber of Assur-Bani-Pal at Nineveh; Sargon II reigned circa 722-705 BC and Ashdod a Philistine city rebelled in 713 BC and were defeated by the commanding officer of Sargon II's army. 2. Isa 20:3-4 - Isaiah as a naked sign to Egypt and Ethiopia who foolishly looked to Assyria rather than God for help; prophecy regarding Assyria taking captive Egyptians and Ethiopians<3568>. 3. Isa 20:5;Isa 30:3,5 - at that time Egypt was dominated by an Ethiopian dynasty. 4. Isa 20:2,4,6;Isa 36:4,6 - trusting in the broken reed of Egypt. 2. Isa 21:1 - (KJV) "The burden"<4853>, (NIV) "An oracle"; "the desert<4057> by the Sea<3220>" is thought to refer to Babylon which had the Euphrates through it and was conquered by Cyrus diverting the river and marching through; the Babylon of Revelation is thought to refer to Rome which has the Tiber River run through it while the city is only 15 miles from the Tyyrhenian Sea; some feel the Desert by the Sea perhaps has some application to Saudi Arabia. 3. Isa 21:2 - "Go up, O 'Elam'[(<5956> can mean "distant, hidden, or eternity") and Elam when used in the sense of a country had Susa or 'Shushan'(<7800> can mean "lilly" as in something white or pure) as the capital of Elam which became one of three royal cities in the Persian empire and the one where Darius I built his palace which figured prominently in Est 1:2,5; 2:3; 3:15]: besiege O Media" - would seem to refer to the taking of Babylon (Isa 21:9;Jer 51:11;Isa 13:17-19) by the Medes and Persians in the time of Cyrus; could such treachery also relate to modern day Iran (formerly Persia)? And as Michael Parry noted in his 2009 comments could 'Babylon'<894> also relate to the destruction of the last days Babylon of Rome with its associated confusion (Rev 17:1-9, 14;Rev 18:8-10, 18-24). 4. Isa 21:3-5 - could this be the defenders of Babylon unprepared during a night of feasting with their king suddenly fearful due to the miraculous writing on the wall (Dan 5:1-6, 22-31)? 5. Isa 21:6 - the watchmen of Israel were the prophets (Isa 52:8;Isa 56:10;Isa 62:6;Eze 3:17;Mic 7:4). 6. Isa 21:11 - The burden of 'Dumah'[<1746> means "silence" (some have suggested as in the silence of death) and was a son of Ishmael (Gen 25:13-14, 18) and they dwelled south of Judah while "Seir"<8165> means "rough, hairy, shaggy" is the dwelling place of Esau or Edom (Deut 33:2; the end times with Christ and the saints Hab 3:3, 12-13? Psa 16:10;Isa 63:1-6) from the Dead Sea to the Red Sea. 7. Isa 21:12 - is this the judgment of life with Christ and the permanent darkness of those excluded? "return, come" (back to God). 8. Isa 21:13 - "The burden upon Arabia"; "Dedanim"<1720>; is there also a latter day application of an Arabian burden (Eze 38:13)? 10. Isa 21:17 - "the mighty men of the children of 'Keder'<6938>, shall be diminished"
20:3 Spare a thought for Isaiah’s dignity, and commitment to the ministry he had been given, as he walked naked and barefoot. We should always try and enter the mind of the prophets when we read the narrative of their actions. 21:7-9 These words of judgment against Babylon are echoed, in a shorter form in Isa 47:11. Have you ever wondered how you will react to the changes that come on the world just before the return of Christ? We are probably think that we will welcome them because they will mean the end of wickedness and injustice, and bring in the beginning of God's plan for righteousness and world peace. But consider this: In Isaiah's day, he prophesied about the fall of Babylon. Oh, yes, people sure wanted to see Babylon fall. Babylon was a blood-thirsty, violent nation that caused distress to nations all around the world. But Babylon was also the center of world trade. The economy was reliant on Babylon. People were dependent on Babylon for their trade, livelihoods and security. Without Babylon there would be no income or luxuries like they had before. Here are some of the reactions to the fall of Babylon: "Therefore my loins are filled with anguish ... I am bowed down so that I cannot hear, I am dismayed so that I cannot see. My heart staggers; horror has appalled me." (Isa 21:3-4). Babylon's fall as prophesied by Isaiah was a prelude to the fall of Babylon at the return of Christ, described in Revelation 18. At that time everyone will also be distressed by it's fall. What about us? How attached will we be to the systems of this world? And how much will we welcome the changes brought about by Jesus Christ? 21:9 Of course Babylon did not fall during the time Isaiah was prophesying. Isaiah is seeing an event that was a long time in the future and was being seen when Assyria was still a threat to Judah. v.14 says a lot about having the right attitude. What is our reasoning behind the things we do for God? Is it of necessity, or is it willingly? We hear people say words along the lines of 'better to do it out of a sense of necessity than not at all'. Reading passages like this, we see that this is not true. It we work for the Lord out of a sense of duty, rather than willingly, then there seems to be little if anything gained. 1Chr.29:17, Psa.110:3, 2Cor.8:12, 9:5-7, 1Pet.5:2.
v. 24 Demas figures favourably in two of letters Here and [Colossians 4:14] But by the time Paul is on trial for his life Demas has 'left the truth' [2 Timothy 4:10]. There is no 'looking back' once one has put the hand to the plough. It is [Matthew 10:22] 'he that endures to the end' that will be saved. The tenor of the whole of the letter is one of an appeal. Paul appeals to the compassion of Onesimus when encouraging him to accept Onesimus back.. So often we bludgeon others to accept what we want. This letter provides a wonderful example of a quiet, but powerful, appeal to Philemon's appreciation of the Gospel. As such it stands as an example of how we should respond to our brethren and sisters. One thing I have learned through teaching the word of God to various people is that the person who has benefited most and come to the fullest understanding from what I have taught, has been myself. It never ceases to amaze me how that teaching something to someone else reinforces what you already know. So Paul's advice to Philemon is absolutely brilliant! He says, "I pray that you may be active in sharing your faith, so that you will have a full understanding of every good thing we have in Christ." So we learn that there are, not two, but three really good reasons to share our faith. We need to share our faith to spread the gospel message so that others can be saved. We need to do it to obey the commandment that Christ gave. And we should share our faith so that we can consolidate and strengthen our own faith as we obey Christ's commandment and spread the gospel. Of course, Paul's advice was not just for Philemon, it is for us as well. So let us not just share our faith, but be active in sharing our faith. Let's do it more and more. Paul prayed it for you too, "I pray that you may be active in sharing your faith, so that you will have a full understanding of every good thing we have in Christ." PHILEMON 2. Paul uses word “fellow” in three different ways in this short letter. Fellow comes from a base word, “SUN” 4862 which has a strong meaning of closeness, unity, it also has a sense of completeness, which shows how close Paul was to those who he associated with. 1:1,10 Twice Paul speaks of himself as a prisoner. Onesimus, who Paul was writing to Philemon about, was to all intents a prisoner as he was a bondslave. Philemon would treat Paul with compassion. Paul was using his position as prisoner to encourage Philemon to show the same degree of compassion on his returning slave who is now also a brother in Christ. There is a strong contrast given in this letter between authority and love. Paul had the authority, in Christ, to order Philemon to accept Onesimus (v.8). However, he chose to appeal to him on the grounds of love (v.9). Incidentally, Philemon means friendly, based on the Greek root word phileo which means (brotherly) love. Paul's appeal to love rather than authority was an object lesson for Philemon. As a man of authority over Onesimus, he wielded considerable power. Under Roman law, a runaway slave faced the death penalty. But because of Paul's approach to him, he was favourably disposed to act in love towards Onesimus. The lesson for us is clear: love should be our motivation in all our dealings, even though (and especially) we might be in a position of authority. V.15 Philemon lost a slave, but for a moment, but gained a brother forever. The bond between a master and slave would no longer be that of ownership by purchase (or birth), which death could dissolve, but their common relationship to Christ, which made them brethren now, and in the kingdom; for evermore. It is amazing how big a difference our small actions of faith and love can make. We may think we are insignificant and only doing our duty as we invite people for a meal, listen to a distressed brother or sister, get caught reading our Bibles, pray for those who need strength or visit the sick, but those small actions can make bigger waves than we expect. Philemon might have been one such person. Paul said of him, "Your love has given me great joy and encouragement, because you, brother, have refreshed the hearts of the saints." (Philem 7) Imagine that! In Philemon's acts of faith and love to the people around him and the people that came to visit him, he even gave great joy and encouragement to Paul! His actions were not aimed at bringing joy to Paul or he would probably have chosen something quite different to do. But in Philemon's every day life of love and faith, even the great apostle Paul was given joy and encouragement. Our little actions of faith and love do not go unnoticed either. We may have no idea who will be encouraged by what we do or say, but what we can be sure of is that our enthusiasm, shown through our faith and love, will go far further than what we might think. Let's give someone joy and encouragement by showing our love today. “To Colosse? To Philemon? Well, I …er …” Whatever discussion took place Onesimus agreed, probably because Paul had given him a letter addressed to Brother Philemon. “Give him this,” Paul encouraged, “and I’m sure you'll be all right.” And, we have to suppose, he was. 1:3 In giving grace and peace from God we see that the letter is not Paul’s but Gods. Paul is merely the messenger. It is not the position of men to, without permission, to pass on greetings from another. Throughout the short letter to Philemon, we can build up some details about the man, who is described by the Father, through Paul, as "dearly beloved" and a "fellow labourer" (Philem 1:1). Philemon (meaning friendly) held the ecclesia in his home with his family who were in the truth (Philem 1:2). He refreshed his brothers and sisters (Philem 1:7) and had ministered to Paul (by implication "in thy stead" - Philem 1:13). Philemon is marked out as having a forgiving spirit that would go further than requested (Philem 1:21) and was also a man of prayer (Philem 1:22). Philemon is an example for us to follow. 1:7 It is evident that Philemon’s generosity was felt by a large number of the believers in Colosse – a powerful argument in Paul’s reasoning that he should be careful for Onesimus, his runaway servant. Philemon (means friendly) was the master and Onesimus (means profitable) was the servant (slave). Under Roman law a runaway slave could be sentenced to death. However, Philemon took Onesimus back, not only as a servant but also as a brother. The parallel exists between our master, Jesus, and us as servants. If we remain faithful we are called friends (John 15:14). If we stray and come back we are welcomed (Luke 15:32). If we stay away, we are subject to death as the Roman slave would be. Nevertheless, we should realize that our service, unlike Onesimus', is considered unprofitable (Luke 17:10). 1:11 Onesimus’ name means ‘profitable’ so Paul is making a play on his name. Not simply to be clever but to highlight that now he was a brother he was able to really be profitable to Philemon. What is the letter to Philemon all about? Most Bible commentaries say it's about a runaway slave, but is that likely? There are several clues in the text that show us the most likely answer. 1) v18 "if he has wronged you or owes anything". 2) v11 "who once was unprofitable to you". 3) v15 "he departed for a while...". So we get the clear picture that Onesimus had been "let go" by his master, possibly for ill conduct or because he simply wasn't needed, or perhaps wasn't profitable. The text gives no indication he had run away so that seems unlikely to me. We should beware of reading Bible commentaries rather than doing our own study. So why did Paul wish to send him back? To you and me, being a slave is unimaginable. But in a country where there is no welfare state, being a slave (as long as it was to a good master) would be the only source of food, clothing and shelter for those who had no other means. This is hard for us to understand. Think of it in terms of life or death. And not just for the slave, perhaps he had a wife and children too. Who would feed them if you had no employment? So Paul is sending Onesimus back to his former master for employment, arguing that he is now a changed man, and profitable (v11). Paul wouldn't be able to provide for Onesimus himself, no matter how much he wanted to keep him (v13). Paul is hoping that, once Onesimus is back in Philemon's care, he might be sent back to Paul to continue to minister to him, but this time at Philemon's expense (v13-14). Also, perhaps verse 21 is suggesting that Philemon might from now on see him as a free man too? A willing servant, not just a grudging slave? Idolatry was not an issue in sending Onesimus back to Philemon (Deut 23:15). However, Onesimus needed to return for two reasons: Under Roman law runaway slaves were doomed to certain death, and here is Onesimus in Rome! Here lies the quintessential reason why Paul had to send Onesimus back to Philemon that he may obtain his freedom legally, which only Philemon could do according to Roman law. Onesimus also needed to go back to make reconciliation possible, and so Paul prays for Philemon’s compassion deeply rooted in his spiritual obligation to him as his spiritual father. At no time did Paul command or presume Onesimus’ emancipation (verse 14). Rather, Paul commended Philemon for the loving compassion he showed his fellow brethren in Christ and then interceded on Onesimus’ behalf who would be returning to him as one of these brothers. 1:13 If a slave ran away under the law of Moses there was no obligation for him to be returned to his master. 1:5 So we see that Paul is able to personalise his general comment in Col 1:4. The love that the ecclesia showed to Paul was seen specifically in Philemon. 1:22 How effective do we think prayer is? Paul saw Philemon’s prayer as an essential part of his plans to visit him. Do we view prayer as so important or is it just a formality? 1:12 Onesimus ran away from Philemon and according to the law of Moses Paul was not obliged to return him Deut 23:15-16. However he does send him back so he must have had great confidence that Philemon would behave correctly towards his errant servant Onesimus. 1:4 Paul, repeatedly in his letters, says that he mentions different individuals and communities in his prayers. Are our private prayers concerned with things we want or do we think to mention those who we know who have needs as well? 1:20 “let me have joy of you” is a wonderful invitation! Paul was inviting Philemon to manifest the spirit of forgiveness so that Paul might joy. Do we behave in the same way towards those who might have wronged us? Do we look for their repentance so we can “joy” Or are we more concerned with humiliating that person? "And one thing more: Prepare a guest room for me, because I hope to be restored to you in answer to your prayers." (Philem v.22). It's one thing to pray for something to happen, but it's quite another to be so convinced that God will answer your prayers that we actually do something in preparation for that prayer to be answered. Paul told Philemon, "Prepare your guestroom because I am on my way. I haven't been released from prison yet, but I know I will be, because you have been praying." Imagine Philemon painting and wallpapering his guestroom. Someone asks, "What are you doing?" Philemon's answer would be, "I'm getting ready for Paul to stay." The reply, "But he's in prison!" And Philemon finally responds, "I've been praying - and he will be out soon." We need to work on having as much faith in answers to prayer as Paul and Philemon had. They remind me of the prayer meeting when the church turned up to pray for rain. Only one lady brought an umbrella! Let's be that one. Let's be sure of the answers to prayer God will give. He has done it before and he will do it again. They may not always be the answers we want, but he will answer. So prepare the guest room, pick up your umbrella, recruit some more Sunday School teachers, plan a mission trip. God answers prayer. Let's be ready when it happens. 1:2 This letter to Philemon dealt with a delicate issue. A servant who had run away from his master. The issue was, potentially, complicated by the fact that the slave had now accepted the gospel and been baptised into Christ. To start to sow the seeds of reconciliation between the servant and Philemon Paul speaks of Philemon as a “fellow labourer” with himself thus encouraging Philemon to identify with Paul and his work rather than seek retribution against the runaway slave. 1:23-24 Rom 16:1-15contains many greetings between believers. We see the same here. Clearly an indication of the close knit structure of the first century believers. I know some people who are great preachers. No matter where they are or who they are with, they seem to make opportunities to share their faith. I listen to them with awe. It all seems to come so seamlessly, a natural part of the conversation. Wouldn't it be great if those of us who were not so good at sharing our faith could leave it all to them? Unfortunately those few people cannot be everywhere at every moment in time, so that's where the rest of us - and Philemon - come in. Listen to what Paul said to Philemon: "I pray that you may be active in sharing your faith, so that you will have a full understanding of every good thing we have in Christ." (Philem v.6). The instruction to be active in sharing our faith is just as much for us as it is for Philemon. We might not be good at it, but we might be the only person someone else has ever heard the gospel from. The three or four people we might know who are good at sharing their faith cannot possibly reach the whole world. You never know, God might have someone who just needs to hear it from you. We can and we do make a difference when we preach. So let's be active in sharing our faith.